Bird identification is for the most part easier than insect or spider identification say. Most birds can be identified by a combination of their image and a knowledge of the habitat they are in at the time. Bird watchers do not have to wade through incomprehensible keys. For most parts of the world there are now good colour guides to the local bird fauna. Wherever you are however some basic rules apply, the most important of which is learning to observe. You will need to know your way around the birds body, its topography. Learning the basic terminology makes life a lot easier, the difference between an 'eyestripe' which goes through the eye and a 'supercilium' which goes above the eye can be crucial. The image to the left is a colour depiction of the various bird parts. A very useful and enjoyable habit to develop is drawing in a note book. If you go out on a field trip and see one or more species of bird you are unfamiliar with making a quick sketch can make the difference between a successful identification and frustration. These drawings do not need to be works of art, though you will be surprised how much you improve if you keep at it. Drawing is also a good way of focusing your eye, of making yourself look at the bird. What shape is the tail, how long are the legs, how large is the bill in relationship to the head what colour is the eye, is there an eye ring? Asking yourself a series of questions like these will help you get into the habit of seeing the important diagnostic features. 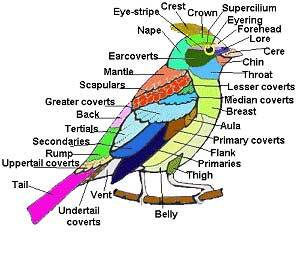 With a bit of luck the unrealistically coloured hypothetical bird below will help you with the basics. Birds are not static objects, they move, hop, jump, walk and fly around the countryside. A birds general shape (e.g. the black eagle, raven and gaint kingfisher) and the way it moves is its GIZ (GIS). Getting to know a birds giz can be very useful in helping you narrow down your options. Does it walk up trees or flit from branch to branch? Read up on, and observe, different flight patterns, birds fly in many different ways, watch them sometime you will be amazed. Watching birds fly is often an inspiring experience. Some birds make song flights always in a specific form, hovering or descending in a particular way. Other birds sing from definite parts of a tree, some from the top some from lower down, some form within the shrubbery. Finally read what your bird guide says about distribution, if the bird you think you have I identified only occurs in Florida and places south of there and you are in Oregon it is most likely you have not got the correct bird. Remember birds migrate, so sometime they are only in your area for a few months of the year, or less. It is important to remember that birds are not just visual images, they make sounds as well. Many birds make little noises all the time, these are known as calls, less frequently heard but often easier to distinguish are songs. Bird calls are an excellent way of getting to know what birds are around you because you often can hear the calls way before you see the bird, especially in woods or forests. You can learn a birds calls by watching it and listening but you will pick things up much more quickly if you:- a) buy some tapes or CDs of bird songs and calls, or b) join a bird watching group or go on an identification course. If practical, it is recommended that you join a birding group, or society. Many societies like the National Audubon Society of America and the RSPB, originally of the UK have local groups that organise outings. There are also many other local groups which organise walks lead by someone knowledgeable, Forestry, National Parks and Conservation Organisations are a good place to start. Also many colleges will hold occasional, or regular courses on bird identification.